Vegas Casino is licensed in Panama and welcomes players from the United States. 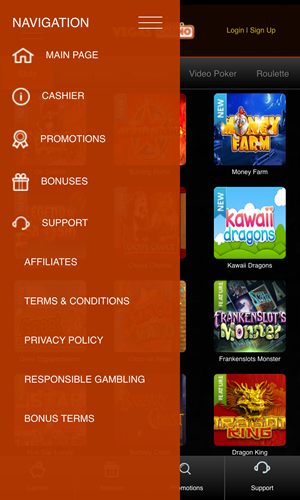 All games are tested independently to verify the fairness of odds and payouts. Choose from over 350 bitcoin slots, blackjack, roulette, poker and baccarat games. Play live dealer games where you can see and interact with hot Latina & Asian dealers. BTC deposits are processed instantly and withdrawals usually take less than an hour. Full bitcoin sportsbook also available. Wager on every major US or European sport. 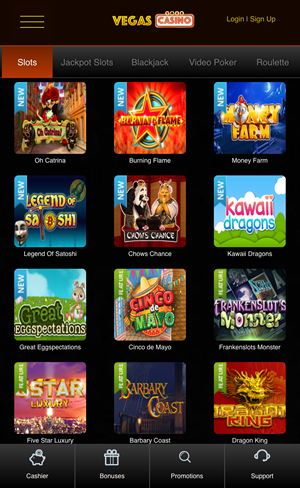 Over 150 Vegas Casino games can be played on iPhone, Android or Windows Phone. Get a 100% first deposit bonus to 1 BTC. Regular players get a 25% reload bonus. VegasCasino was established in 2015 and is owned by Vegas Royal S.A. Despite being relatively new on the scene, they have quickly become one of the dominant BTC casinos. The site welcomes players from the U. S. and the rest of the world. 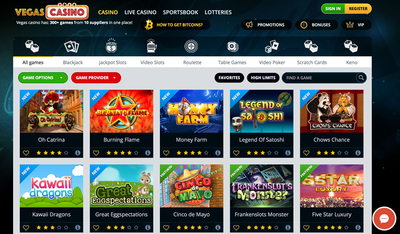 With over 300 games on offer, VegasCasino is one of the largest bitcoin casinos around. Finding yourself a game is easy: either use the search function if you have a particular game in mind, or alternatively browse through the different categories listed. If you are a sucker for slots, you’ve found the right place: choose from progressive jackpot games where you can bag a huge bounty for very little btc, iconic 3 reel slots and an assortment of video slots. Card lovers are also catered for with casino favourites such as blackjack, baccarat and poker, as well as simple and fun games like Top Card Trumps and Three Card Rummy. You'll also find roulette, keno and an array of virtual scratchcards as well as weekly raffles and lotteries where you can win up to 6 BTC. ​Bets start from as little as 0.01 mBTC and run as high as 12.5 BTC, and practice plays are offered across all games. At VegasCasino.io you can sit at live casino tables from the comfort of your own home. Live casinos add a little bit of Las Vegas excitement by allowing you to see, hear and even chat to your dealer through the in-game chat function. It doesn't hurt that most of the dealers are very attractive women. Try your hand at either blackjack or baccarat, or alternatively have a spin on the real life roulette wheel. Live casino bets start from just 5 mBTC. While Vegas Casino is not "Provably Fair' in the cryptographic sense, all of the games are tested independently by Gaming Labs International to ensure that the odds are not rigged and the payouts are competitive. Vegas Casino is one of the most generous bitcoin casinos when it comes to bonuses and promotions. New depositors receive a 100% welcome bonus on up to 1000 mBTC and a 25% bonus on every subsequent deposit. There is also a VIP program that gives lucrative prizes to loyal players, ranging from the latest MacBook to a brand new car. VegasCasino.io is compatible with any iPhone, iPad, Windows Phone or Android device. Navigation is optimised for mobile devices making it super easy to find and play any game on the move. Live casino games from the desktop version are absent, however, there are still over 150 to choose from, including roulette, blackjack, poker and slots. Live Chat support is also available from smartphones and tablets. Opening a new account takes seconds. The sign-up form asks for a username, password, date of birth and e-mail address. No KYC. Deposits are credited to player accounts after 1 confirmation so you can start playing almost instantly. The minimum deposit amount is very low at 1 mBTC and there is no maximum limit imposed. Withdrawals are usually processed within an hour. If you run into any issues or simply have a question about the site, you can contact support by emailing cs@vegascasino.io. There is also 24/7 live chat feature for those who need quick answers. 2-Step Verification can be enabled using Google Authenticator for added security. VegasCasino has quickly become the casino of choice for many bitcoin gamblers. With over 300 games to choose from, numerous live dealer tables, a huge welcome bonus and ultra-fast deposits, it is not hard to see why. Their games are also audited independently to ensure fairness so you can be sure you're not being cheated. 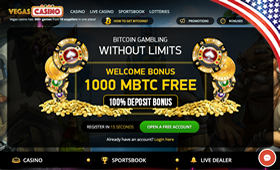 Open to U. S. players and with a minimum deposit of only 1 mBTC, anybody and everybody is welcome at Vegas Casino.